Roof inspections are basically a check that determines the reliability of a roof, how long it could last, and at what time it would have to be replaced. Roof inspectors will not climb up on your roof or the roof of home you wish to buy and rebuke shingles or tiles. Roof inspectors have particular measures in which they could find out the natural life of given roof with no tearing into it. At first glimpse it may look like that roofing inspectors will have to pull up a section of the roof to perform a meticulous check, however if you think about your own roof, you will not like anyone ripping holes in it only to notice if it is good in shape. Some roofers also provide a very basic roof check up that normally comprise of inspecting the roof’s outer surface and apparent components like metal flashings; but, a more detailed inspection could help spot areas of prospective distress and aware the owner to issues that perhaps may result in further costly damage. Roof inspections are not costly. This roofing inspection undeniably offers peace of mind. 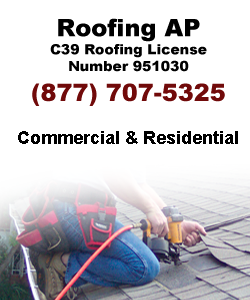 Contact AP roofing contractors in Los Angeles and get roof inspection in Los Angeles in reliable manner.